Add a decorative twist to your home with this modern plant stand. Your prized plant or floral arrangement can be perched atop this stand's sturdy base, and dual shelves offer added space for a vase or other decorative elements. Available in dark cherry. 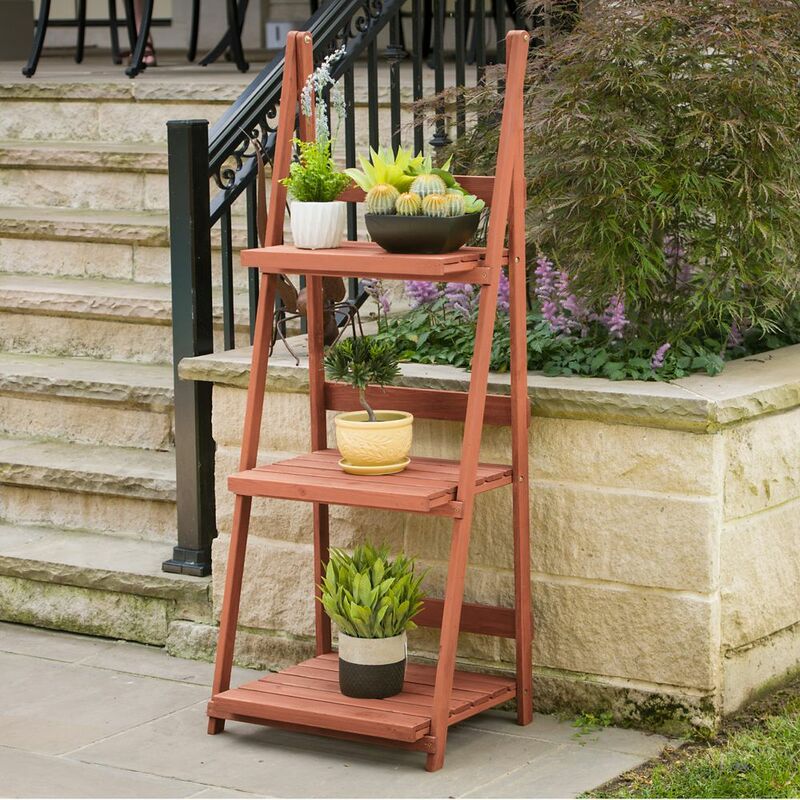 3-Tier A-frame Plant Stand 3-tier plant stand with stair-step design never looks out of place. Multi-functional use to display plants, books or your favourite treasures. Crafted of solid wood harvested from the Cypress tree family with decay resistance similar to Western Red Cedar. Moisture resistant for maximum weather protection. Easy-to-assemble. 3-Tier A-frame Plant Stand is rated 4.7 out of 5 by 6. Rated 5 out of 5 by Saturn from Easy setup & has a great look.... Easy setup & has a great look. Rated 3 out of 5 by Sam from Plant Stand Review This plant stand came already assembled and was, therefore, easy to set up. I did put a coat of weatherproofing on it as the wood is really rather of poor quality and extremely soft. Time will tell. Rated 5 out of 5 by Homer from Good Plant Stand Arrived promptly. . .no assembly required. . . .just open up and place in your desired location. . . .not quite as sturdy as I expected, but that does not lower my rating. . .very functional! Rated 5 out of 5 by lovetoshop01 from Great for plants in small patios It was so easy take it out of the box and it's together! Great for my small apartment patio. Rated 5 out of 5 by Trish from Sturdy The plant stand is nice for the cose. It is not super fancy but looks nice on the sun porch.